You'll be working in pairs: two people to one machine. You just need to login as ONE of you. Login: login to the machine in CentOS. Quiz: Each person will individually take a short quiz. You will be exploring if expressions in modifying a Picture with a compound boolean expression. The goal is to make a bird picture with the bird wearing a "Black and White" convict suit for Halloween. Read and understand the makeConvict() method that you already copied into Picture.java. It is not yet complete. What do you predict that it currently does? Run the Lab6A.java application, select bird1.jpg as your picture and see what happens. There is an if statement which replaces green pixels with black on the bird – only on rows in the picture whose indexes are even and a certain level of green. In particular, it changes the pixel color to black if its y index is even AND the pixel's level of green is more than 180. Compile, Run, choose bird1.jpg from mediasources and check that your bird now wears a convict's horizontally striped black and white outfit. The two if expressions are one way to do it, but not the only way (or the best way). Rework them to be one if statement that checks for green > 180, and inside the body of that if statement, have an if – else statement that will either assign black or white stripes based on the value of the y index. Run your code to verify that the new set of if statements does the same thing as the original set. But there's still a problem with a our convict bird! The stripes are two thin. Modify the code so that each stripe is two pixels tall instead of one. You completed code should look like the bird below. HINT: This can be done by modifying the modulus statements in the conditional. Switch driver and navigator: if you've been controlling the mouse and keyboard, it's time for your partner to do so. Compile the code, run it and test on a picture (we recommend flower1.jpg). Go to that line in Picture.java. This should be the line assigning a value to redValue. To assign to redValue we need to "look at" three pixels: (x-1,y), (x,y) and (x+1,y). Why do you think we have an index out of bounds error? Fix the if statement so that we only calculate an average and update the pixel color when x is bigger than the first column AND smaller than the last column. You will need to make two changes in the controlling boolean expression of that if statement. Compile and Run. Did it work? Ask if you are not sure exactly why your if expression is now keeping you from getting an error. Now you are going to write your own method that performs a similar blur. The bird's head is getting the striped effect too. Use Picture explorer to find the y height of the head. Modify your code so that the head doesn't get changed from green. The quizzes are open book & note, but closed Dr Java and partner. 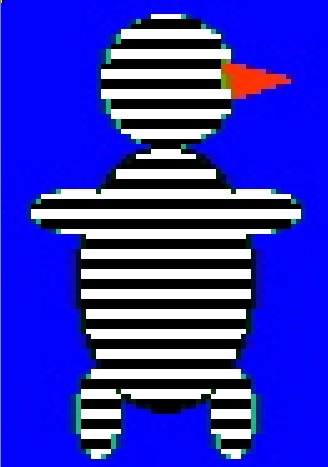 * make a picture of a bird have a convict suite (black and white striped). /* * Lab6B.java – Blurring a picture.